-Tomas Satoransky left scouts less than impressed with his performance in the first game yesterday, and his slightly better performance in his second game here will apparently be the last impression he leaves in Treviso. Satoransky has left the event to make the trip across the Atlantic in anticipation of his workouts with NBA teams, registering a DNP in the first game of day two. In his time here, he struggled to get to the rim off the bounce, did not shoot the ball very well, and does not appear to have improved significantly since last season, but remains an intriguing talent thanks to his feel for the game and raw athleticism, as evidenced by his strong showing in the athleticism testing. With so many high-level decision makers in attendance it is difficult to understand his decision to leave the event so quickly, and depending on how he fares in his upcoming workouts, Satoransky is a candidate to withdraw from the draft. Should he follow that path, he'll be automatically eligible for next year's draft as a 1991-born prospect. Despite only narrowly qualifying for the Copa del Rey together with his Banca Civica Sevilla club, Tomas Satoransky managed to advance past the quarterfinals with a win over Unicaja, thus giving us (and the dozen or so NBA teams in attendance) two opportunities to watch him in Barcelona. Satoransky saw almost all of the 28 total minutes he played at the point guard position, only attempting five shots overall, which is a fairly representative sample of the role he's asked to play for this team. Measured at an impressive 6-7 at the adidas EuroCamp in Treviso last June, Satoransky has tremendous size for either guard position, even if his 6-7 wingspan and 207 pound frame are just average. He's a solid athlete, capable of playing above the rim, but not showing tremendous quickness in the half-court or the type of blow-by speed you expect to see from a player at his position in the NBA. Once appearing rail thin when we first saw him all the way back in the summer of 2008, he's done a nice job developing his body over the last few years, and will likely continue to fill out considering he's still only 20 years old. After a terrific adidas EuroCamp performance last summer, many were expecting Satoransky to have a breakout year in this, his third season in the ACB. Instead, through 22 games, his minutes, usage rate and scoring output are actually down from last season, which is a bit disappointing. The backup to American guard Earl Calloway, Satoransky plays a somewhat limited role for Sevilla, often being asked to just bring the ball up the floor, hand it off to a teammate, and then move to the corner and see how the offense develops. Watching his film from the entire season, Satoransky has noticeably lacked aggressiveness, often pulling the ball back in transition, deferring to teammates excessively, and even passing up good opportunities to score. While it's clear that this team is built around the inside scoring prowess of Paul Davis (the league's best per-minute scorer), Satoransky's role makes him a bit difficult to evaluate. It's unlikely he would see many minutes (if any) at the point guard position in the NBA, making his situation in Sevilla very foreign compared with how he might be utilized at that level. Further complicating matters is the way Satoransky's jumper has regressed as of late. Whereas last season he made 40% of his 2.5 3-point attempts per-game, this year he's both taking (1.5) and making (30%) less of these shots, while continuing to show the same unattractive mechanics we've seen throughout his career. With time and space, Satoransky is capable of making his catch and shoot jumpers, but things seem to fall apart for him when forced to shoot quickly and/or off the dribble. While not overly aggressive with the ball in his hands, Satoransky has the ability to create offense for himself and others, something we've seen from him in other settings. He's a solid ball-handler with both hands showing good footwork and body control, and using nice court vision finding open teammates creatively. He doesn't always have the initial burst to turn the corner on his matchup, which makes it difficult for him to break down opponents in the half-court at end of shot-clock situations, and he lacks some strength, toughness and/or aggressiveness finishing plays around the basket. Defensively, Satoransky has good size and plays with a solid intensity level, often being asked to put pressure on the ball, even very far away from the basket. Showing just average lateral quickness, he gets beat off the dribble a fair amount by smaller players, and may have an even more difficult time in the NBA where there is considerably more space to attack slow-footed guards, something that may be a concern moving forward. While Satoransky's size and basketball IQ continue to stand out and leave room for optimism regarding his future, it's difficult to point out any one part of his game that will translate seamlessly to the NBA at this stage. Whether it's his role on this team, his youth, the overall style of European (and particularly Spanish) basketball, or just a lack of development, it's difficult to get overly excited about what Satoransky has shown up until this point this season. 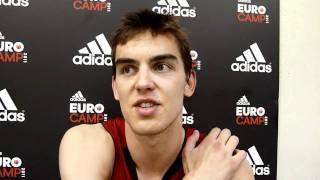 Barring another tremendous showing at the adidas EuroCamp in June, Satoransky may have to wait until his draft-eligible year (2013) if his goal is to get drafted in the first round and/or get brought over immediately to the NBA next season. Otherwise he'll have to hope he gets picked by a strong organization in the second round and be optimistic that things work out for the best. To his credit, he is reportedly very much gung-ho about the NBA style of basketball and would likely do whatever it takes to make it in the NBA, which can't be said about all young European players these days. Tomas Satoransky yet again stood out, duplicating his performance from yesterday with an aggressive first half of the day and a fatigued second half. Satoransky looked absolutely fantastic in the first game of day two scoring 18 points on an uber-efficient 7/8 shooting. He also added 6 rebounds and got onlookers talking about what a solid camp this is shaping up to be for him. In the final game of the day, the All-star game, Satoransky only mustered 4 points on 1/5 shooting, but that didn't dissuade anyone of his future as a legit NBA draft prospect, potentially a 2012 first round pick. He's been impressive enough thus far in the mornings to warrant a little rest in the afternoons. We spoke with Satoransky about his performance at the adidas Eurocamp this year, as well as in 2009 and 2010, and what his thoughts are on potentially playing in the NBA at some point. Tomas Satoransky may have been the biggest revelation of day two, coming up with some dazzling moves that demonstrated the fact that this 17-year old has absolutely no fear of going up against players four or five years older than him. After looking quite bashful in the first day, Satoransky started off the day in impressive fashion in the mornings drills, showing impressive ball-handling skills and court vision in transition, and then continuing his strong play in the actual game as well. Satoransky mixed in a strong first step with excellent footwork and some crafty spin-moves, showing great fluidity and coordination to go along with his terrific size. Although he didnt always have the strength to finish his moves inside, it was interesting to see how much shake he has to his game already despite his young age. He plays with a real winning spirit, looking highly unselfish, yet still being very active, even if his perimeter shooting needs to improve. If he continues to develop at the same rate, he clearly has a great future ahead of him. At the very least hes shown that he isnt ranked as our #1 prospect in the 1991 international class all year long for nothing. The MVP of the U-18 European Championship, Division B, a few weeks ago, Tomas Satoransky (or Tomas Satoranski) did not disappoint in the least bit with his performance, although he did have to sit out his teams last game with the flu. Satoransky is a skinny, athletic wing player with excellent size at 6-6, but a pretty poor frame and short arms. He gets off the floor extremely well and can really finish around the rim, but is most notable for his excellent feel for the game, as he sees the floor incredibly well and is an absolutely spectacular passer. He regularly found teammates cutting to the rim with his fantastic court vision, either pushing the ball up the court in transition, or taking the ball to the basket and driving and dishing in the half-court. Despite standing around 6-6, Satoransky plays point guard for his national team, and led the entire U-18 Division B in assists at 6.4 per game. Satoranskys jumper is not pretty by any stretch of the imagination, its an ugly flat-footed stroke with a one-handed release, but it goes in at a pretty good rate, particularly from mid-range, but sometimes from behind the arc too. This doesnt appear to be his biggest strength, though, and its definitely something hell have to work on if hes to reach his full potential. He wasnt the most aggressive player here in terms of looking for his own offense in general. Satoransky is incredibly young, born in late 1991, which makes him just 16 years old still. He needs to grow into his frame and his overall game as well, but he seems to have some nice tools to build off. He apparently has quite a few contract offers on the table from teams in Spain after his showing in the U-18s, but hell be staying in the Czech league with his team Praha for now. Well be keeping tabs over the next few years to see how he continues to develop.